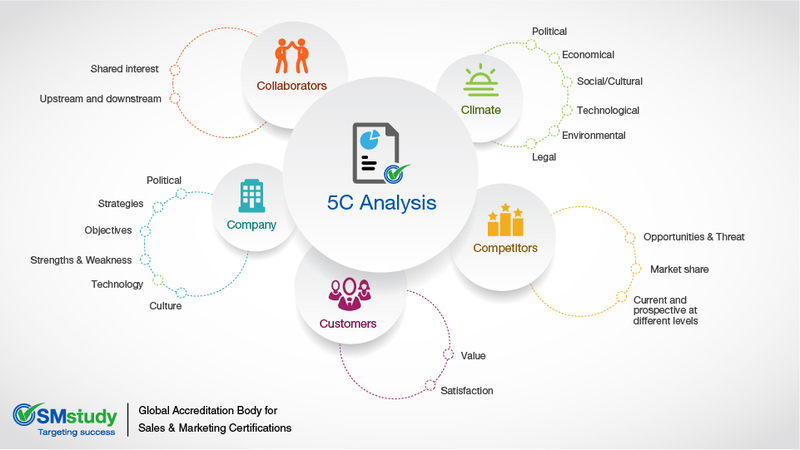 5C Analysis is a technique used to conduct situation analysis. Conducting a situation analysis is one of the important steps in identifying the research problem. A situation analysis involves examining the external environmental factors and internal organizational capabilities that impact how a company operates. 5C Analysis is one of the most popular and useful frameworks in understanding internal and external environments. It is an extension of the 3C Analysis that originally included Company, Customers, and Competitors. Collaborators and Climate were later added to the analysis to make it comprehensive. This integrated analysis covers the most important areas of marketing, and the insights generated can help identify the key problems and challenges facing the organization. However, it should be noted that not all five elements need to be considered when identifying the problem in a particular area of marketing. Depending on the area of marketing under scrutiny, some areas need to be given more importance than others. Company—The company analysis studies an organization’s vision, strategies, capabilities, product line, technology, culture, and objectives. It is useful in understanding the existing and potential problems with the company’s business. Customers—Understanding customers is a key part of situation analysis. It involves knowing the target audience, their behavior, market size, market growth, buying patterns, average purchase size, frequency of purchase, and preferred retail channels. Competitors—Competitor analysis is critical in understanding the external environment in which the firm operates. This analysis involves knowing the competitors’ strengths, weaknesses, positioning, market share, and upcoming initiatives. Collaborators—Collaborators are the external stakeholders who team up with the organization in a mutually beneficial partnership. Agencies, suppliers, distributors, and business partners are typical collaborators. It is important to understand their capabilities, performances, and issues to better identify business problems. Climate—Climate analysis is the evaluation of the macro-environmental factors affecting the business. PESTEL analysis can be used to analyze climate—political, economic, social/cultural, technological, environmental, and legal scenarios are included in PESTEL. To learn more about 5C analysis and other situation analysis techniques, visit SMstudy.com.